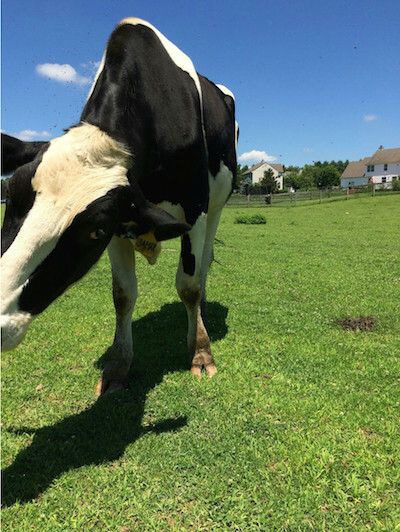 Stories from the farm, by Chenoa Manor’s student interns. Having constantly been surrounded by images of scenic farms, happy cows, and green pastures on a carton of milk or can of yogurt, I have long felt a sense of false familiarity with farm animals. I’ve watched my fair share of animal documentaries of the Planet Earth variety as well as those exposing cruelty that animals are being exposed to due to human actions. I stopped eating beef and pork when I was around ten and felt almost a kinship to animals because of this. My brain had almost tricked itself into thinking that I had met and experienced pigs and cows because I felt some sort of theoretical attachment to them through those images and films. So when I walked onto Chenoa Manor for my first day of my internship I didn’t feel particularly nervous about interacting with the animals or even amazed that that day would be the first day I pet a cow or hung out with a pig. That is, until I began to actually engage in those activities. Jamar and Kasper are the two cows currently living at Chenoa. Kasper is 22–which is extremely old for a cow–very thin, and mostly white. He is infamous for his curmudgeonly attitude, and though he bonds well with Jamar, he often could care less about the humans surrounding him. Jamar just turned four. He was a rescued veal calf who came to Chenoa when he was still relatively small. He now towers over me, weighing at least half a ton; he truly is a friendly giant. When I first met Jamar, he approached me, licked my legs and nuzzled his utterly gigantic head and snout against my stomach. Occasionally whipping his head back and forth to fend off flies, he would then return to cuddling, licking and snuggling. Kasper remained aloof and walked slowly away when I tried to approach him. There was no question that I was unprepared for the experience of interacting with these magnificent, playful creatures. So much bigger than I had anticipated, so responsive and warm. Jamar’s fur was soft, his nose wet, tongue coarse, and ears with a mind of their own. I continued to spend a portion of my time at Chenoa with Jamar in his pasture–rubbing his back, admiring his jutting bones and allowing him to nuzzle against my legs. As each day progressed I felt him recognizing me more. One day he stayed longer for me to pet him, the next day he followed me when I started to walk away and nudged me from behind to continue, and just today as I turned around he began quickly nodding his head up and down and lifting his front feet off the ground like he wanted to play. Though slightly terrifying, this gesture was also unbelievably heart warming. Slowly but surely he was accepting me into his own by not only allowing me to do things that were nice for him but trying to include me in activities he himself enjoyed. So this active effort of slowly putting in time until Jamar felt comfortable had worked thus far. And that’s the type of work that I am used to: focus on something, work towards it, put all you have into it and a good result should come. However, what I failed to take into account was what other animals could be observing. This past week, my third week at Chenoa, when I went over to greet Jamar he was standing next to Kasper. Kasper stayed for a few moments and just as I was expecting him to walk away he licked my hand and moved his head around to let me pet him. I stayed for a while until after twenty or so minutes he lost interest. Thinking it may have been a fluke, on my next day at the farm I approached them both again, hands outstretched to each of them. Jamar immediately responded, being the cuddly youngster that he is, and Kasper sniffed, licked and stayed. He then continued to rub his head against my hand and against Jamar’s side. Somehow, through observing my relationship with Jamar, Kasper had become more comfortable with my presence. I was so focused on one task–bonding with Jamar–that I failed to realize the other ways my actions were affecting my surroundings (either positively or negatively). In my daily life, I am not always good at letting things come as they will. I can work hard and attack a problem but struggle to be patient in allowing others to come to me. If someone is upset, I want to talk about it. If I’ve done something wrong I want to address it and fix it in the most concrete way possible. However, as I have learned in my daily life, and as Kasper has taught me, this is not always the best approach. You can’t always be in control of how another person or animal will see you, but you can be in control of your actions and your approach towards others and this on its own will be enough.